It’s that time of the year again, so without further ado, these are the photo books that impressed me the most this past year. 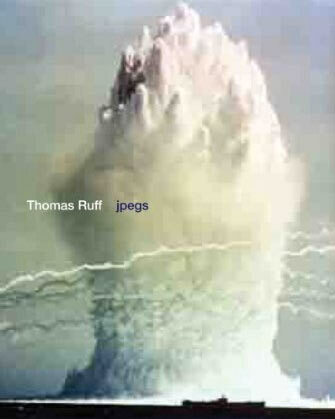 I’m listing them in no particular order, with the exception of the very first one: jpegs by Thomas Ruff. Cutting-edge work, challenging the way we think about photographs, presented beautifully in a large (but not too large) book, maybe in the best possible way (since I don’t think the work gains anything from blowing it up even larger and hanging it in a gallery or museum). It’s tempting to dismiss this work as too simple or too obvious or too cerebral, but I don’t think it qualifies for any of these dismissals. American Power by Mitch Epstein has a renowned photographer not only producing very fine work, but also making a clear political statement. With photojournalism in so much trouble, American Power shows that fine-art photographers can produce work that is not “just” beautiful, but that is also very relevant for the state of the world we live in. Another book in this vein would be The Last Days of Shishmaref by Dana Lixenberg, which I somehow missed last year. Just like in Epstein’s case, tackling contemporary issues using fine-art photography, including many stunningly beautiful portraits. In terms of the photography, there doesn’t appear to exist an equivalent for Boarding House by Roger Ballen, and this haunting body of work is the best he has done so far. In My Mother’s Footsteps by Yishay Garbasz is a very personal re-discovery of the photographer’s mother’s fate, from Holland all the way to the concentration camps in Poland. Greater Atlanta by Mark Steinmetz is the third book in a trilogy of work shot in the South. Greater Atlanta, just like its two predecessors, contains stunningly beautiful portraits. Of course, the same is true for Fall River Boys by Richard Renaldi. I have long been a fan of Renaldi’s portraiture, and Fall River Boys - published by his and his partner’s own publishing company - shows him at his very best. After many projects that I thought were extremely disappointing, Proud Flesh by Sally Mann saw the artist return to her old strength as an artist. While still employing the wet-plate process, Proud Flesh employs it as more than merely a visual gimmick. Andreas Gefeller - Photographs compiles the strongest images from the artist’s “Supervision” series in a very convincing way - showing where and how it works extremely well. The Place of No Roads by Lille Lenkkeri is almost as much a meditation on photography as a photo book itself. Writing in photography books so often is tedious or contrived, and The Place of No Roads shows that there is no reason why that should be the case. Yard Sale Photographs by Adam Bartos contains images from, well, yard sales - a very lyrical, quiet, and subtle book. Lastly, there is Dorothea Lange - A Life Beyond Limits by Linda Gordon - a wonderful example of a biography of a photographer. Looking through this list after having compiled it confirms what I have been thinking for a while, namely that there is no simple way to describe what contemporary photography is, and it cannot be tied to criteria such as colour versus b/w or large-format versus 35mm or digital versus analog.